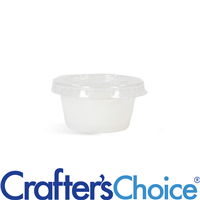 Large Deli Cup with Lid holds 2 oz or 60 ml of product. 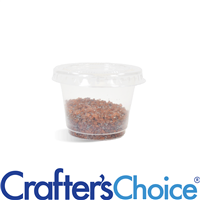 Great for larger samples at craft fairs and store fronts! Fill container with product. Snap lid to close. COMMENTS: I used these containers for some whipped body butter i made for my christmas gifts and so far i have had no complaints except one container that just refuses to close. I will definitely be reordering. COMMENTS: I used these in my lotion bars and the kids was hard at first to get on... Once I did they r easier after that.. Love the convenience of this for after done throw it away..
"Clear Deli Cup with Lid - Large"
COMMENTS: Clear Deli Cup with Lid - Large is the perfect size for a lotion bar. You can mold it and store it in the same container. The lid snaps on and doesn't fall off like some other container lids. Works great for me. "How many cups come in 1 set?" Staff Answer One set includes one cup and one lid. "What is the recycle code # that is printed on the bottom? " Staff Answer This has a recycle # of 5.